The overall condition is good. There is no major wear on carpets and no visible staining. All systems work as designed per the seller! The patio awning is brand new. All electric slides work great. She has no leaks, and all the windows are tight. Stock #172071 Beautiful fifth wheel with lots of options -- ready for a new owner! If you are in the market for a fifth wheel, look no further than this 2005 Compass 34CK3, priced right at $17,750. 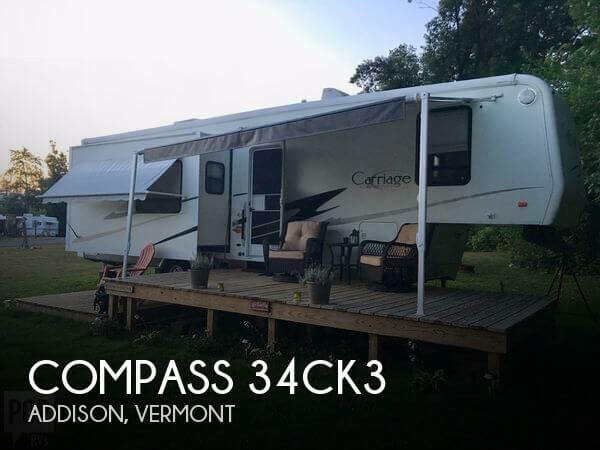 This Fifth Wheel is located in Addison, Vermont and is in good condition. Reason for selling is not using. There is s a new full-size 5th Wheel fabric RV Cover. Mor/Ryde independent suspension system & Pin Box G-rated tires make for excellent handling and ride. The 12-gallon gas/electric DSI water heater works great. You must see this super-clean luxury fifth wheel from Carri-Lite to appreciate the quality of the products. This unit was rarely used with less than an estimated 10K miles on it. Never lived in as a residence but easily could be! Also selling super-clean 2016 GMC 3500 Diesel Super Cab pick-up truck with 35K miles and 5th-wheel hitch. Priced separately. Stock #167126 2008 CARRIAGE 36' FIFTH WHEEL BUILT LIKE A HOME with BRAND NEW GENERATOR !!! 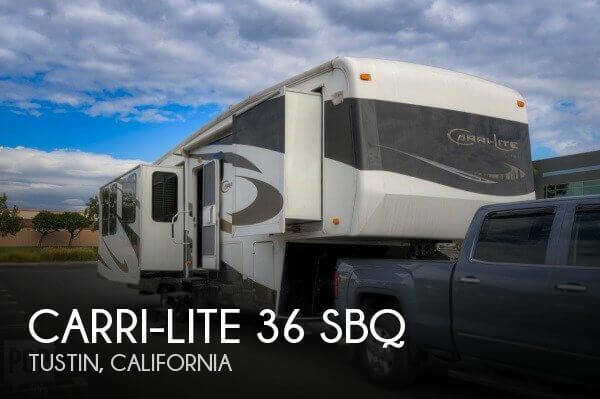 If you are in the market for a fifth wheel, look no further than this 2008 Carri-Lite 36 SBQ, priced right at $35,000. 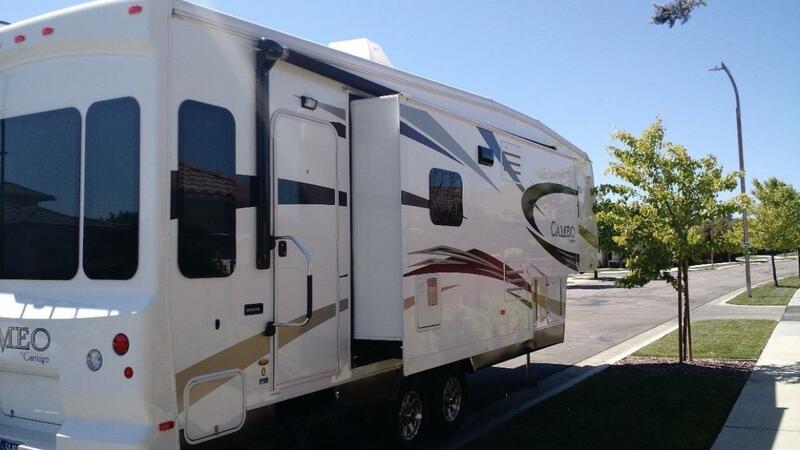 This Fifth Wheel is located in Tustin, California and is in great condition. Reason for selling is health reasons.. The fifth wheel could use some basic TLC although everything appears to work, it just needs a good cleaning to prep for its new owners! The bathroom has a ripped screen I was not able to access all the compartments for photos at this time. 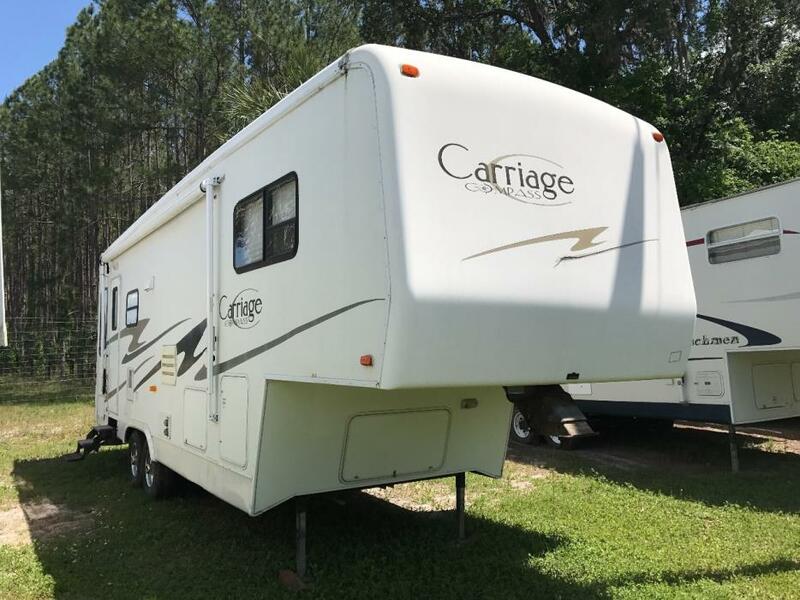 Stock #172666 2008 Carriage Cameo LXI 35SB3 with 3 slides, spacious, with 2 A/C units ready for camping! 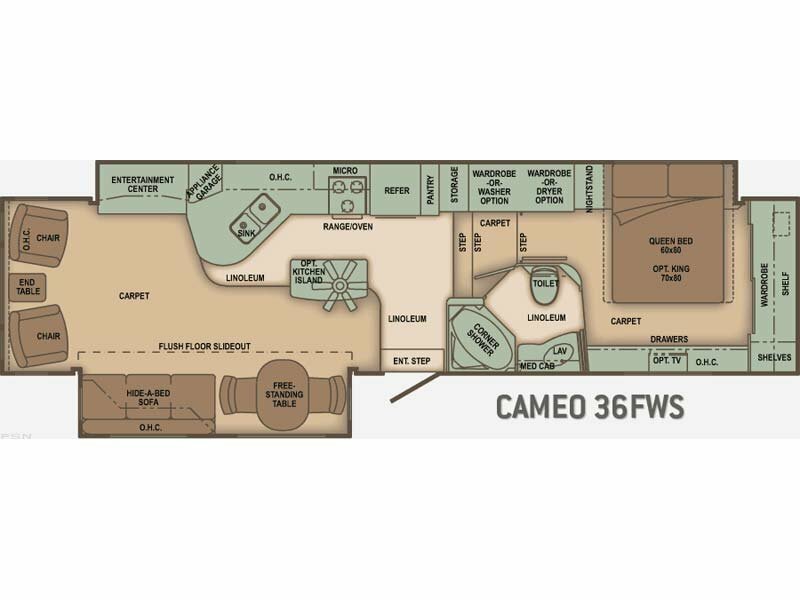 If you are in the market for a fifth wheel, look no further than this 2008 Cameo LXI 35SB3, just reduced to $17,500. This Fifth Wheel is located in Punta Gorda, Florida and is in decent condition. Reason for selling is owners are moving!. The seller states that all mechanical, electrical systems are functional. The kitchen is clean and functional and seating surfaces retain a like-new appearance and condition. The tires have been replaced recently and have very few miles on them. 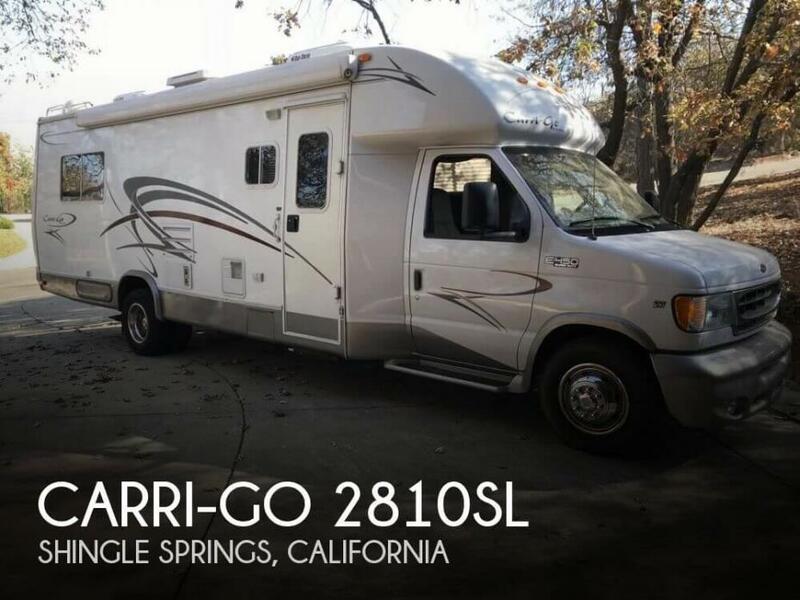 Stock #164287 2004 CARRI-GO BY CARRIAGE CLASS C RV FORD V 10 GAS MINI MOTORHOME Reason for selling is downsizing. As you can see from the pictures this 004 Carri-Lite (by Carriage), 36TXRM5 is in good condition. Per the seller, this unit has been well maintained and has not been used much. It comes with a lot of upgrades and needs a new owner. Stock #163719 This is a very spacious and meticulously maintained beaty, come get carried away in this gorgeous CARRI-LITE. 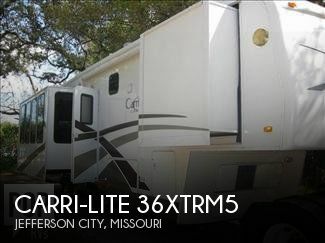 If you are in the market for a fifth wheel, look no further than this 2004 Carri-Lite 36XTRM5, priced right at $22,000. This Fifth Wheel is located in Jefferson City, Missouri and is in good condition. Reason for selling is does not use. This RV is in very fine condition. The exterior shows minimal signs of sun wear and tear, and everything works according to the seller. Inside, there is very little wear showing on the appliances and furniture. All it needs is for the new buyer to bring their stuff and take off for the open road.. The tires have plenty of tread on them, but do show some small cracks. The new buyer will want to replace the tires soon. Stock #162430 Beautiful Fifth Wheel! Pride of Ownership shows! Ready to go and Priced to Sell! 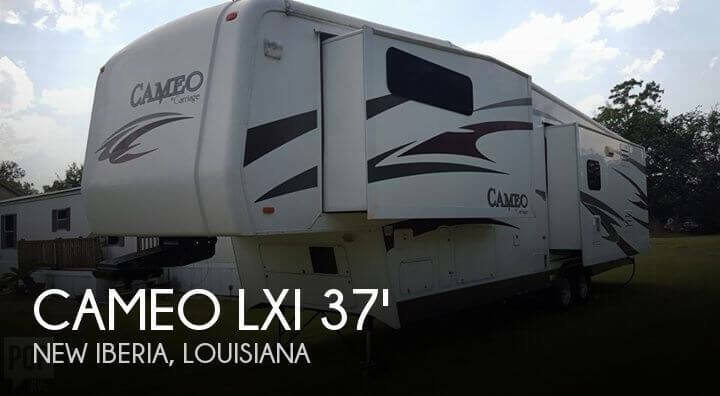 If you are in the market for a fifth wheel, look no further than this 2006 Cameo LXI F35KS3, just reduced to $21,000. 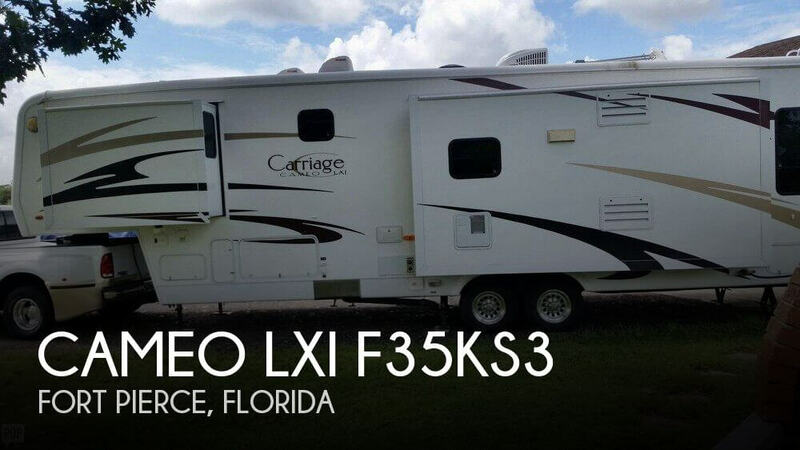 This Fifth Wheel is located in Fort Pierce, Florida and is in great condition. Reason for selling is no longer using. The air conditioner was replaced in 2017 with a new unit without the heat pump feature. In the bedroom, the bed platform can accommodate a Queen/Full-size mattress. However, no mattress comes with this RV. Also, in the bedroom, the TV is not mounted. However, all hardware is available to mount. Seller removed and disposed of the recliners to create a work space. There is a sofa bed which has noticeable wear. Stock #171728 Beautiful Carri-Lite Like New and Loaded with Every Option Lots of Light, washer/dryer, built in vacuum! 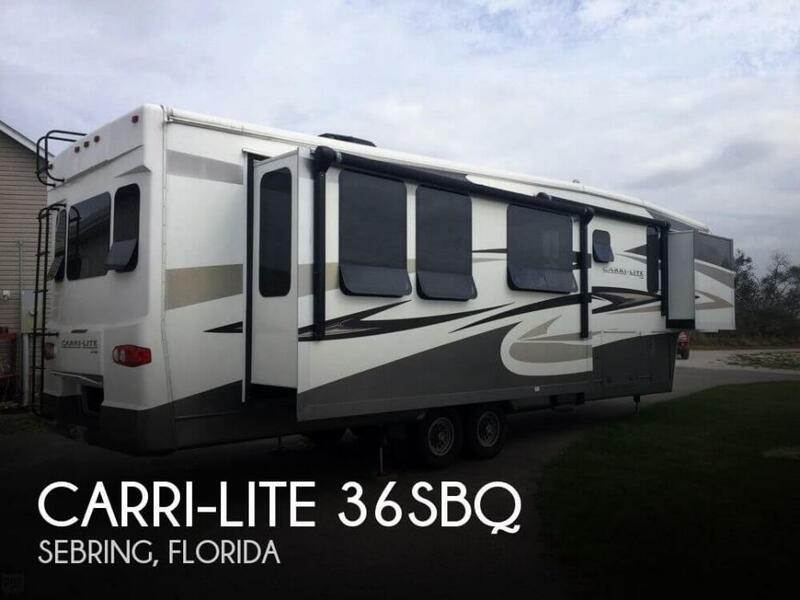 If you are in the market for a fifth wheel, look no further than this 2011 Carri-Lite 36SBQ, just reduced to $42,500. 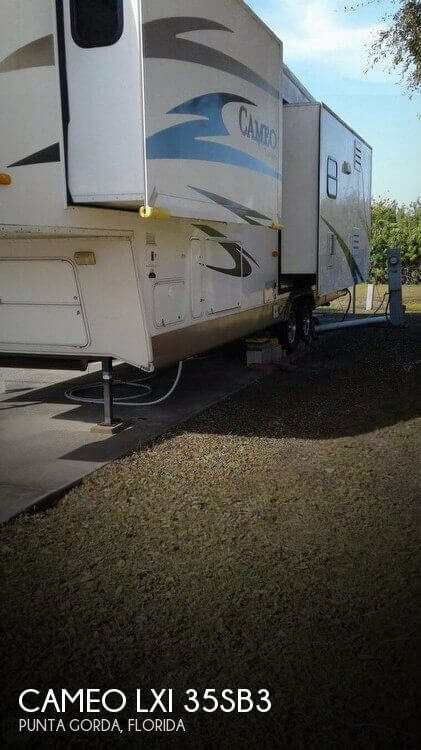 This Fifth Wheel is located in Sebring, Florida and is in good condition. Reason for selling is seller has purchased a home and a full-time size rv is no longer needed.. This unit is in very nice condition. It's obviously been well taken care of by its owners and it shows. All components operate as they should per the owner. The inside and outside of the unit are in like new condition. Stock #117199 TAKING REASONABLE OFFERS - Triple slide, 2 central ducted A/C's, entertainment center with fireplace, large bath area with washer dryer connections! 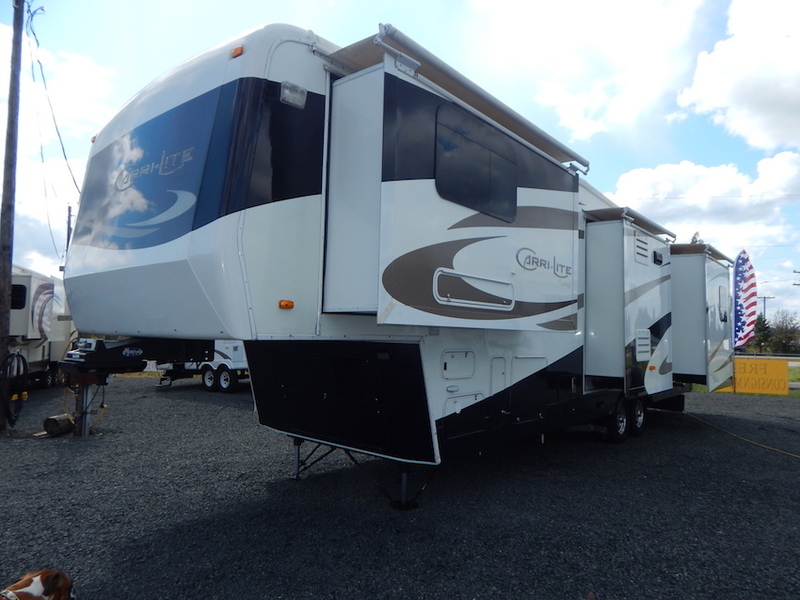 If you are in the market for a fifth wheel, look no further than this 2010 Cameo LXI F37KS3, just reduced to $37,800. This Fifth Wheel is located in New Iberia, Louisiana and is in great condition. Reason for selling is no longer has the time to use the unit. This 2004 has been maintained and serviced by a knowledgeable RV'ER and has always been kept to pristine condition there is a lot optional equipment ,water filters. Exterior shower. Huge storage underneath the list could go on but this is a must see if your in the market. Stock #104047 WOW!!! 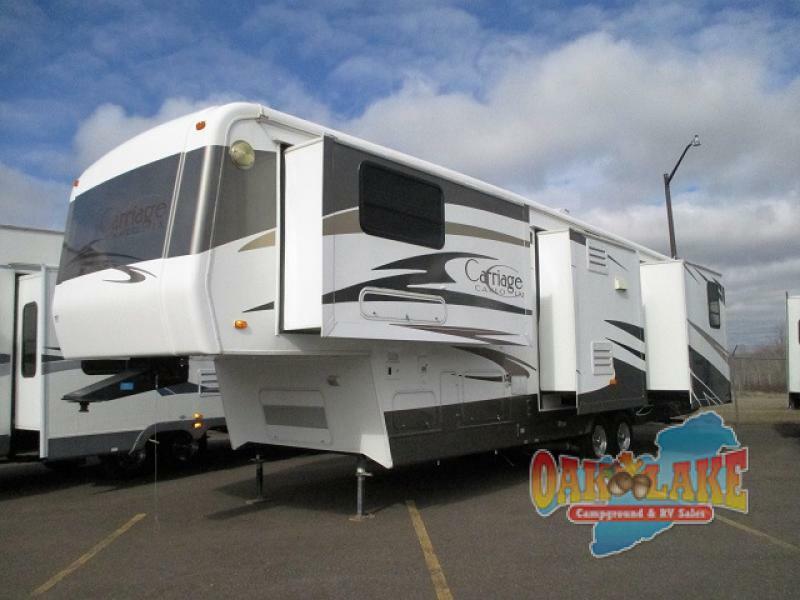 If you are in the market for a fifth wheel, look no further than this 2004 Carriage 34CK3, just reduced to $26,900. 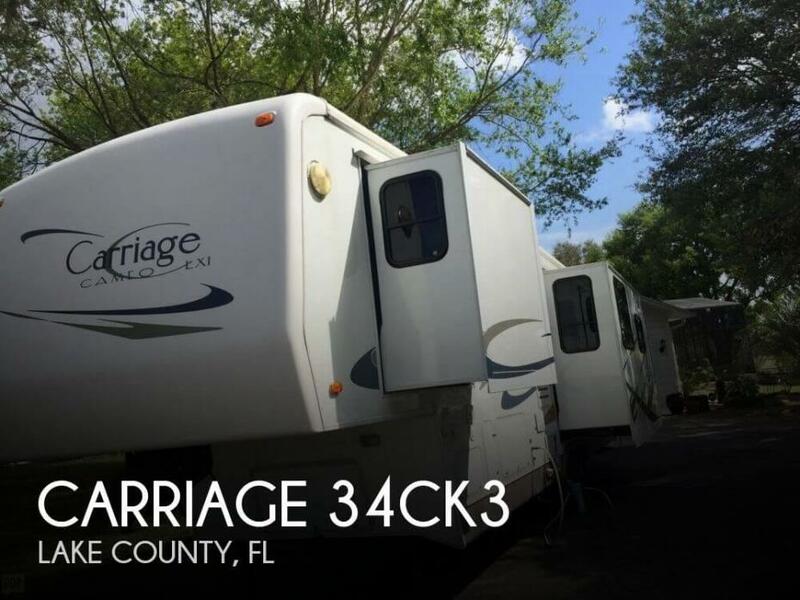 This Fifth Wheel is located in Tavares, Florida and is in great condition. Reason for selling is purchased house. 2006 Carriage Cameo LXI F35CKQ, Quad Slide, Rear Living Space w/Lounge Chairs, Desk/Chair, Ent. Center, Hide-A-Bed, Free Standing Dinette, L-Shaped Kitchen Counter w/Sink Inside Center, Range/Oven, Refrigerator, Pantry, Shower, Ward. & Queen Bed Slideout, Step Up to Bed, Hamper, Drawer Space, Generator Prep, Exterior Shower, and Much More. 2010 Cameo 36FWS Just In! Carriage w/ Full Length Slide! Just In! 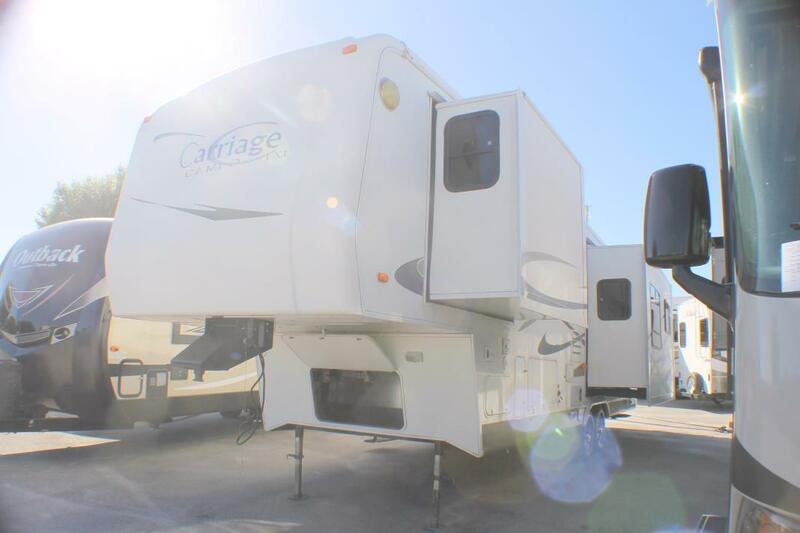 Top of the Line 2010 Carriage Cameo 36FWS 37ft 2 Slide Rear Living! The Pictures Say It All! The Cameo Five-Star Resort Vehicle If you?re considering a Cameo Resort Vehicle by Carriage, chances are you are a seasoned RV?er already. World travelers, Snowbirds, or any educated subscriber to our lifestyle know that there are a lot of so-called ?luxury, full-time? coaches on the market. What Carriage owners know and have come to love is the fact that Carriage products are superior in every way. Elegant rooms, quality design and build, amenities at your fingertips. It?s all by design. You are now entering the new world of resort vehicles. It?s a world we've been comfortable with for over 40 years. We?ll take care of the details. You just choose your premier destination. This is an amazing fifth wheel! It has true quality construction. There are so many nice features and options! It has tons of storage built in throughout the trailer, including extra outdoor storage. IT HAS DUAL PANE WINDOWS with a UV tint to help bump up the insulation, and function in extreme weather. It also has AWNINGS OVER EACH SLIDE for added protection. The layout is wonderful. It has a bank of skylights in the largest livingroom slide. So the whole space is light and bright because of the this and the large windows. It has beautiful maple wood cabinets. The living room has room for you to easily customize the space with your own furniture choices. The entertainment center has a nice desk area with great storage, and there is a fireplace. The kitchen is AMAZING! It has an awesome peninsula layout. The kitchen has tons of countertop space that also gives so much cabinet space. The kitchen is fully equipped with HUGE FOUR DOOR FRIDGE, large double sink, 3 burner stove/oven, and microwave oven with hood fan. The dining table is placed nicely next to the kitchen. The bedroom is wonderful as well with a walk around KING BED, 2 large closet areas, storage under the bed, chest of drawers, and nice built in cabinets, and a second vanity sink, so you have his and hers sinks. The glass french doors that lead to the bedroom have privacy partitions as well that can give added privacy between the bedroom and bathroom. The bathroom has a sink/vanity, good cabinet space and the commode all in one separable room. The big glass enclosed corner shower is in the larger part of the bathroom with another full length closet that has washer/dryer hook ups. This fifth wheel is very spacious with the 3 slides across from each other in the living space, and 2 slides across from each other in the bedroom, giving 5 slides total that completely maximize the space. There are 2 air-conditioners, and large furnace. This trailer is a FOUR SEASONS INSULATED trailer. Meaning it is ready to keep you very comfortable in the cold and hot weather! It has an all ALUMINUM FRAME so it is stronger and more impervious. There is lots of good outdoor storage. It also has a LARGE ELECTRIC PATIO AWNING for all your outdoor fun! ..........................................We inspect every RV in our full service department before we offer it for sale. So we are able to make an AMAZING SERVICE CONTRACT AVAILABLE! Carriage,Cameo F31KSLS, LXI triple slide. Stored in my warehouse since brand new. We used it five short trips. Completely furnished all Linens bedding dishes silverware. And camping accessories. Built-in vacuum generator prep. New fireplace and washer and dryer. Upgraded , Stress less leather recliners. Sofa bed built in safe power awning. Power leveling jacks buy Bigfoot. Two new zero gravity outside recliners. Extra 50 amp cords adapters. New Direct TV satellite and controller. Still in the box. Tool box including tools. To fold up high quality bikes in zip-up covers never ridden. Includes Mor ryde fifth wheel. Everything and anything you need to camp anywhere. Did I mention two flat screen TVs and surround sound convection microwave full oven Corian counters. Real Rosewood Cabinetry. Only 32 foot triple slide. Full four season everything is insulated full belly wrap this is our baby. Unfortunately Health forces sale. . It was sold new in 2012 .Just put new continental batteries , and brand new radial tires@ Americas tire. I do not see another model like this one for sale anywhere in the US. Easy to tow with 3/4 ton or bigger truck. This is a 32-foot and I for one like the ease of handling as compared to a monster. I would consider a late model slide in camper , must have slide out 9.5 ft. with air and generator in trade. I will at this price include a near New Yamaha 3300 ISEB will surge to 3500 watt, electric portable generator. I'm sure there are ton of extras I'm forgetting call me and I can go over them. Fred at 805 four two three 3722 can deliver free up to 200 miles. Thank you.